Tuesday, November 13, 1979—serviced the snowmobile track and found the track adjusting bolt is lost. I have no replacement, so I drove over a 110 miles to Wasilla to get it and a spare belt and some material for the cabin and trapping license. Roads were icy and foggy. Got home late. Wednesday, November 14, 1979—got up early and worked on the snowmobile, got trap gear ready, cut up some wood and Henry and I checked part of the trapline. Didn’t find anything in any of the traps. Helped Tim haul logs with my snowmobile and sled. It was a beautiful sunset. 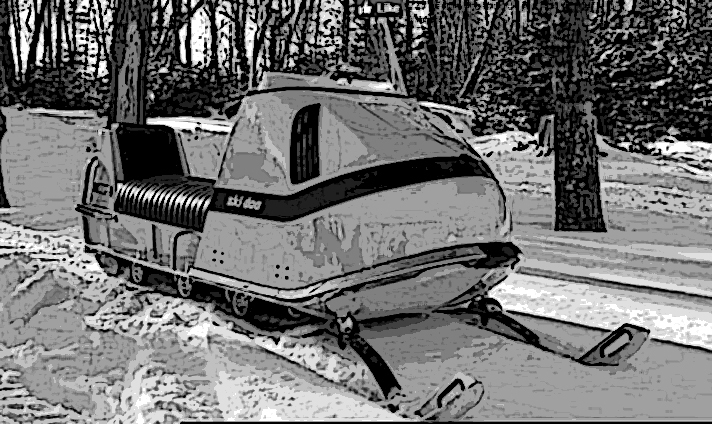 It’s dark enough here now that we need lights on the snowmobile after 4:00 p.m.
Thursday, November 15, 1979—while pulling a heavy load of wood out, I came to a turn and couldn’t get around it quickly enough. I hung the snowmobile up on a spruce and I went out over the windshield and piled over in the snow. Didn’t get hurt. Things like that happen every once in a while. We went down to Cal’s this evening to weigh out some gold. He’d gotten a black wolf already, and a nice wolverine, a mink and a marten so far on his trapline. He’s doing very well. Checked my trapline and I had two rabbits in snares and one had been eaten by something. I set a snare for a lynx and then when I got back to Nelchina, worked on the cabin floor and started the door—been living without a door. Friday, November 16, 1979—it started snowing and is still snowing lightly. We got about 8 inches, but the temperature is quite warm. I got wet getting a load of wood. Ate, then went out on the trapline, but no fur is moving in this weather. Picked up some sets that weren’t producing and saw a cow moose and calf. Saturday, November 17, 1979—last night was Jackie’s birthday and Tim, Mike, Jim and Blake came over here for a while. Then we went over to the lodge for a small party. I tended the bar. Dan Billman was there. He had brought me back four dozen traps that he had gotten for me when he went into Anchorage.